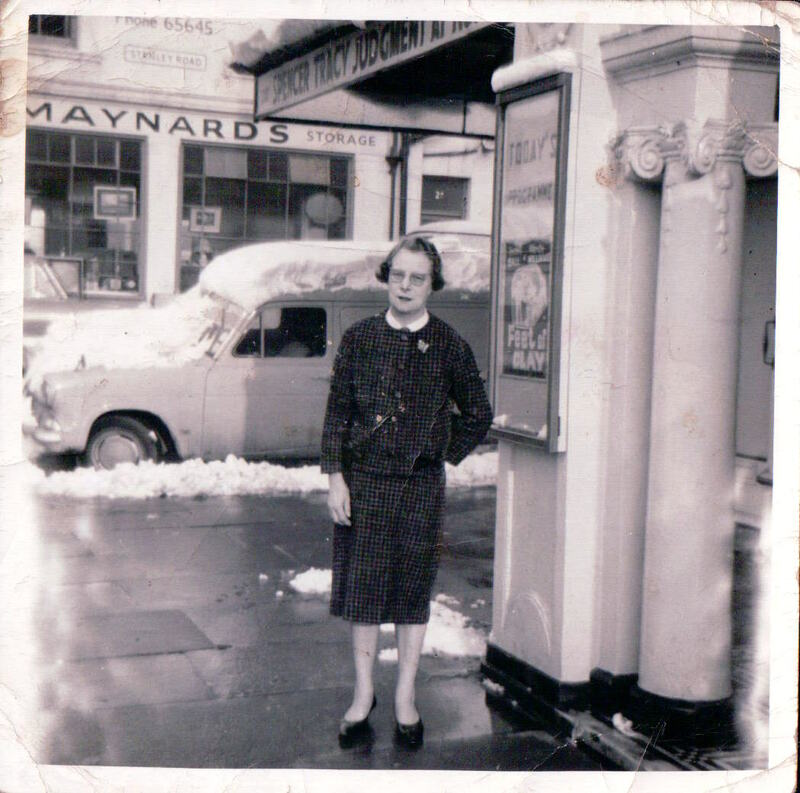 My aunt, Mabel Catling, worked at the Duke of York all her working life. She started when she was 15, and died on the steps there when she was 65. She was known as “Auntie Mabel” to many children. Her father Fred worked there as a doorman after he retired from the railway fire brigade. The photographs here say ‘Glenister & Company’ on the back, and show the period when afternoon tea was served by beautifully attired staff. The staff in the bouquet photo are named as Mrs A Wilson and Mr Tom Weller (known as Tom Mix). It was taken in 1962 on the occasion of Mabel’s 40th working year there. I lived on Campbell Road at Preston Circus so went to The Duke of Yorks quite a lot. This was in the ’50s & ’60s, so Mabel must have been working there then. I remember the tip up seats & some double ones, the toilets upstairs and the sweet shop. You could sit in there all day if you wanted to and it didn’t matter when you went in, even halfway through the film, as you could watch it all again! I saw my first ‘A’ film in there –The Time Machine - with my step- sister Eileen, we were under age of course! Glad to see it’s survived! To Terry: What a great story, your Aunt is a real part of Brighton’s history. I bet she had some great stories to tell about Brighton folk as she would have met loads of people. I started going to The Duke of York’s when I was a teenager in 1971 when I lived in Upper Lewes Road, it was the only cinema where you could get in easily to see an ‘x’ film if you were under 18!! I saw some great films there including ‘Easy Rider’, ‘The Wild Bunch’ and all the ‘Hammer’ horrors with Christopher Lee as ‘Dracula’. After the Dracula films I used to leave my mates at the junction of Ditchling Road and Upper Lewes Road and walk at a fair pace past the dark doorways as the films did spook me a little bit! Well, at 14 years old I suppose that’s why I shouldn’t have been watching them in the first place! I remember Mabel and Tom as they were friends of my Mother Grace. My sister and I were often taken to see them when we went to the London Rd shopping with Mum. My mother worked at the Dukes during WW2 and often did her turn at Fire Watch in case German planes dropped incendiary bombs, standing by with a fire bucket . I remember Aunty Mabel and Tom. In the ’50s and ’60s Mabel worked mostly in the box office and Tom did most of the cleaning. My Mum, Joan Wells, worked in The Dukes as an usherette for many years. My brother Malcolm worked in the projectionist’s booth after school and on saturdays. 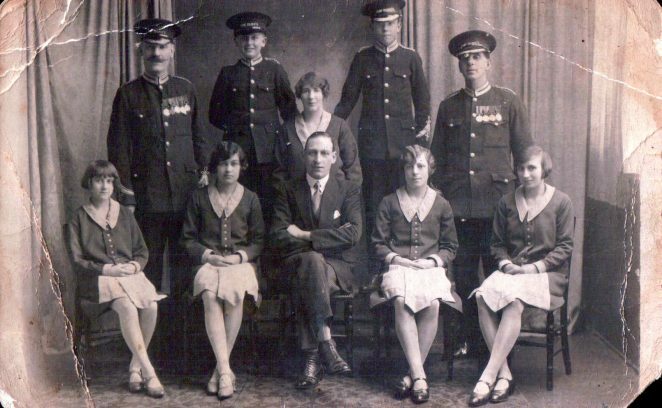 My Dad repaired the seats and sometimes subcontracted the work to me – a shilling a seat. I also worked in The Chocolate Box on a saturday morning. My Mum had many funny stories about The Dukes:Whilst a desert 3D movie was showing, she had a woman sitting in the front row who complained that the camels in the movie were kicking sand into her face and wanted her money back! There were special double seats in the back row and all manner of amorous things took place in them. I have heard that The Dukes is the longest continuously running commercial cinema in the UK – this is almost certainly true. The movie camera was invented in 1893 and the very first movies came out in 1897. These were not films as we know them – they were moving images of ordinary people going about their daily lives. Unfortunately people would not pay enough to go to the the cinema to see themselves and it was all a commercial flop. Then came to movies as we know them today – but that was a decade later. So The Dukes, opening in 1910, was probably in the vangaurd of this new type of enterprise. 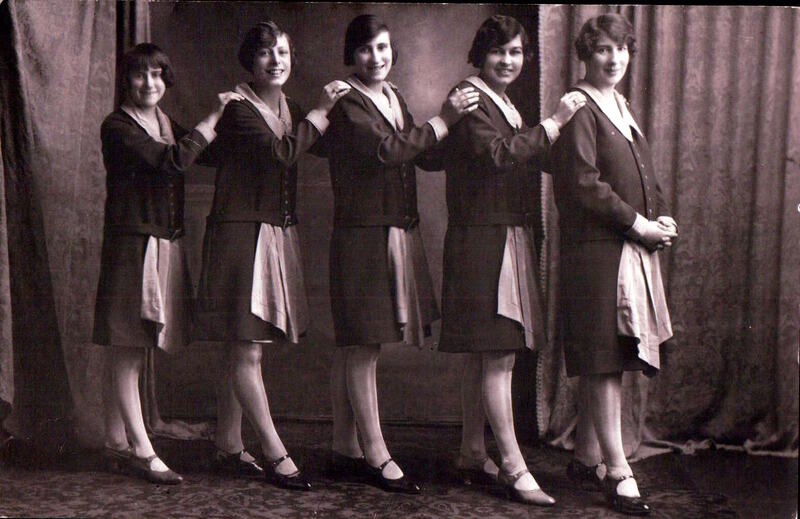 My grandmother’s married name was Younger, and I believe she had two sisters, Mable and Ada, and brother Frederick. I would very like to hear from you if you recognise some of these names – my email is hardy49@sky.com. Best wishes, Carol Hardy. I’m currently researching a gentleman by the name of Ernest Edward Thomas, who is believed to have fired the first shot on the Western Front by a British soldier during WWI. Post-war, he settled in Brighton, working at the Duke of York’s as a commissionaire/doorman from the mid-1920s until 1939. He is pictured in your photograph ‘Staff on parade’ in the back row, far-left. 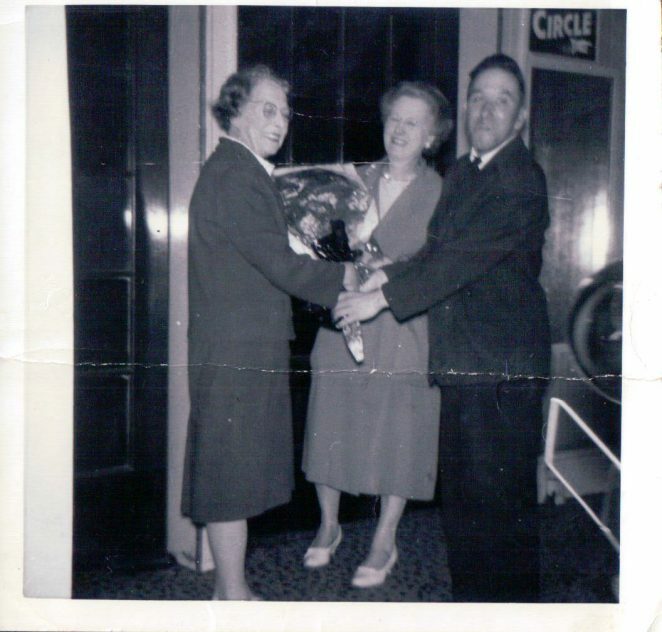 I would be very interested if you happen to have any stories relating to him passed on from your late Aunt Mabel, and, if you would allow the photograph to be used in a museum blog about him, it would be greatly appreciated. I also remember Mabel from the Dukes. My father was projectionist, manager, and subsequently owner of the cinema, and I knew Mabel from when I was a young lad. She always struck me as being very stern but also very kind and generous. Sadly, she died of a brain haemorrage in my fathers arms in the cinema. I also remember Tom who was quite a character in his own way. Both Mabel and Tom were considered part of the fabric of the Dukes, and they will always remain so. Tom (Mix) Weller ate every day at Reid’s Restaurant, previously Eatwell Cafe, during the seventies. I believe his meals were paid weekly by the cinema owner. I too enjoyed some iconic movies there, and am thrilled to note that my middle-aged son will be there this afternoon. Hi David (Drew-Bear). We used to knock about together late 50’s and you used to get me in to your Dad’s Duke of Yorks for free. The usherettes used to always shine their torch to lead us to seats with girls (even if the cinema was virtually empty). If we felt ‘lucky’ we could offer to take the girls up to the posh double seats in the balcony. 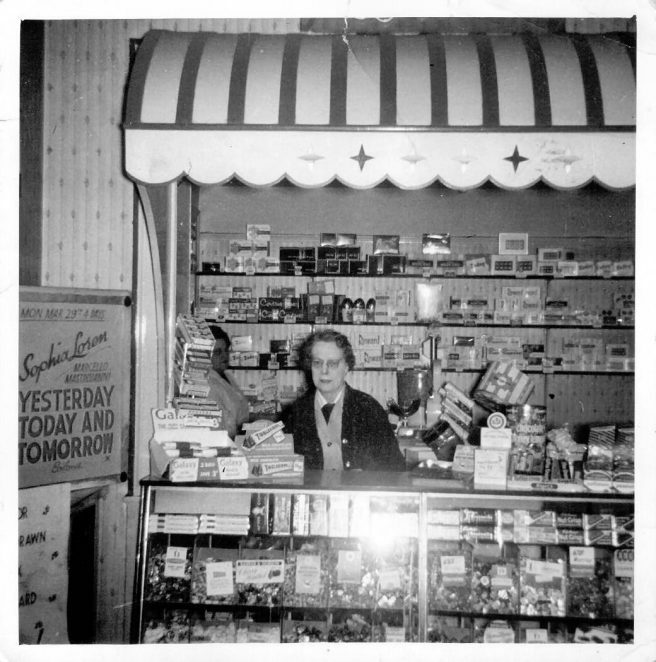 Lovely to see those photos of Aunty Mabel, she lived next door to us in New England St. She would always let my brothers and I go in for free! I remember you could not go into an A certificate film, so we would often wait for an adult who would take us in. We would love to sit upstairs on the double seats. Happy days!